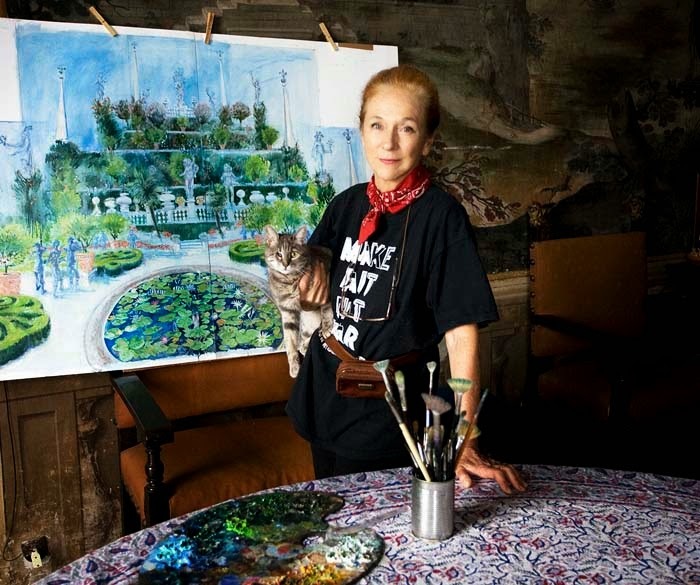 Princess Niké Arrighi Borghese painting at her 16th Century home the Palazzo Borghese in Artena, near Rome: "I work sporadically, anywhere and anytime, on any piece of paper I find. Sometimes I am so attracted by something that it’s like falling in love." NIKE Arrighi Borghese’s work is full of both poetry and a sense of drama and reflect her own delicacy in person and natural vivacity. Her twinkling eyes appear interested in everything around her and she is passionate about her work: she paints and draws at her home the 16th Century Palazzo Borghese in Artena not far from Rome. Born in France but brought up in Australia, Niké married her childhood love, racing car driver, sailor and accomplished engineer the late Prince Paolo Borghese, in Hong Kong before returning to the family property in Italy. The Borghese are one of the most illustrious aristocratic families in Italy and include a Renaissance pope and several cardinals in their lineage. Camillo Borghese became the powerful Pope Paul V in 1605 and his nephew Cardinal Scipione Borghese was a patron of Bernini. During this period, the Borghese family also became some of the largest landowners of the countryside around Rome. 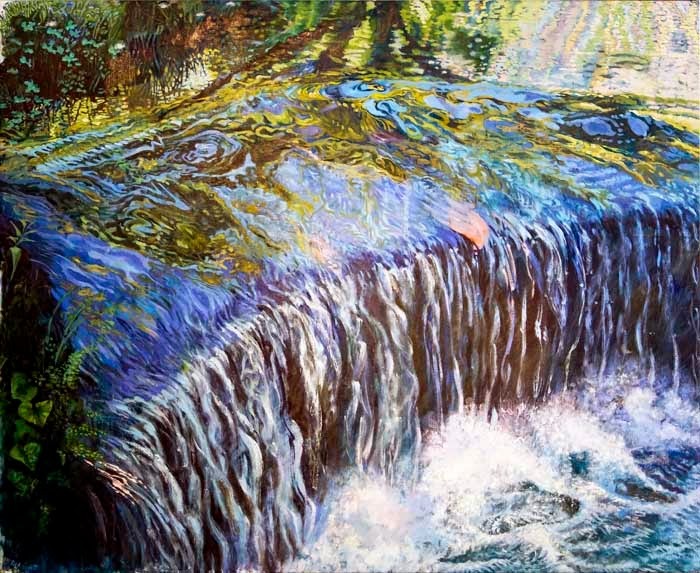 Niké was born in Nice to an Italian father, diplomat and artist Ernesto Arrighi, and an Australian mother Eleanora Cox. She grew up in Sydney’s Vaucluse when her father was Italian consul and studied art at school with one of Australia’s most renowned artists Justin O’Brien. Creativity runs in her family, not only did her father paint and play violin but her mother was related to both the writer Patrick White and architect Philip Cox and her sister Luciana Arrighi became the Academy Award-Winning costume designer. After her schooling in Australia where she attended the Sacred Heart Convent at Elizabeth Bay, Niké travelled to Europe and began modelling for Balenciaga and Nina Ricci in Paris. She then went to London to study at the Royal Academy of Dramatic Art and worked for the next 10 years in film, television and theatre. She worked with 1960s New Wave directors including Francois Truffaut, Jean-Luc Godard and Ken Russell. 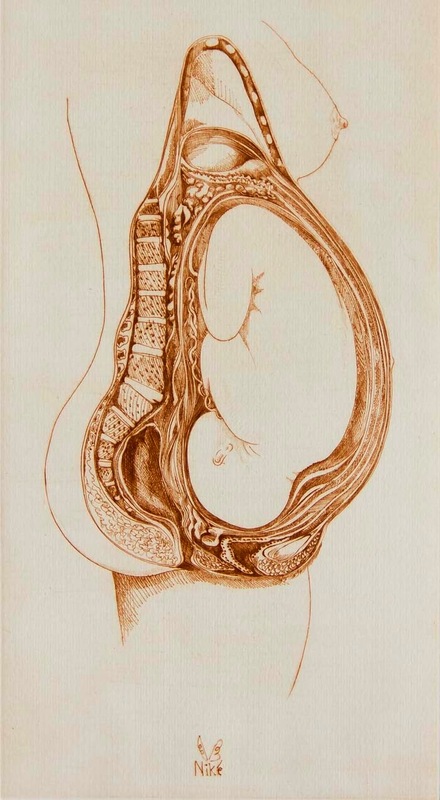 By the 1970s, she had returned to her first love painting and drawing and became a full-time aritist. In 1977, she married Prince Paolo Borghese in Hong Kong, where he was working as an engineer on large civic projects. She had her first solo show at Hong Kong's Quorum Gallery and won First Prize for Graphic Art at the 1976 Biennal at the Hong Kong Modern Art Museum. 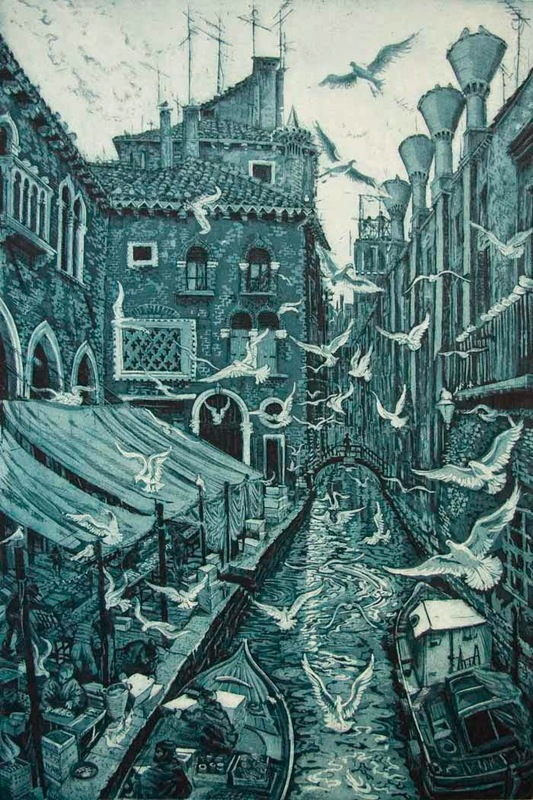 After she returned to Italy in 1984 to live at the Palazzo Borghese with her husband and daughter Flavia, she continued to paint and exhibit at galleries around the world from Sydney to Tokyo and from Paris to Fez. 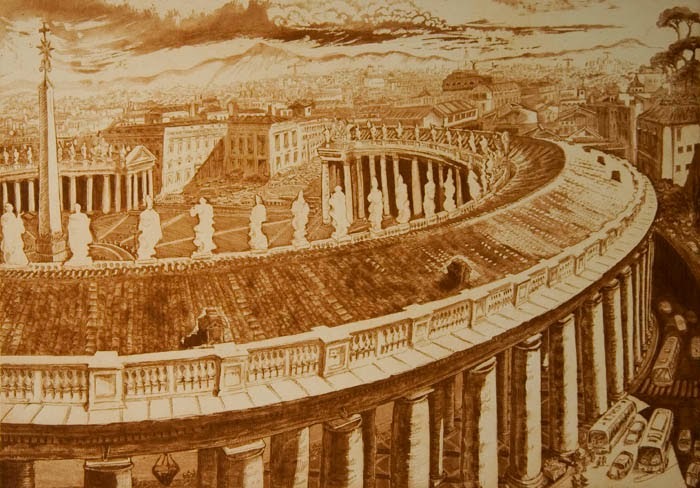 In 2007, she finished her monumental and acclaimed panoramic 360°View of Rome, an enormous work of eight etchings and aquatints. She drew them by turning around on the one spot from the terrace of the Belgian Ambassador's residence in Rome. Among the most important awards for her work, are the Fiorino D'Oro that she won in 1995 and the Donna del Lazio for art she was awarded by the President of the Lazio Region. 1. Where did you grow up and does this place still influence your artwork? 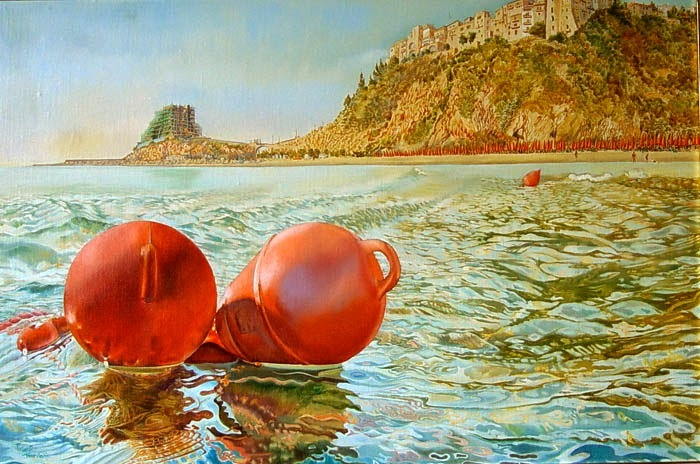 Although I was born in Nice, France, I was brought up in Australia, my mother’s homeland and had a natural, free, healthy childhood in Sydney with an artistic and cultural education and the influence of my mother and her life-long artist friends, such as Justin O’Brien and Jeffrey Smart. They influenced me greatly and encouraged my work as an artist, patiently answering my constant queries: “Justy, Jeffrey how do I mix my turps? Do I stretch the canvas? What colour is best for a backing…?” And I’d go and watch them painting, Justy in Rome and Jeffrey in his bella casa in Tuscany, and I’d learn at a glance what would take an hour’s instruction! 2. You originally began studying art in Sydney, but went on to study acting at the Royal Academy of Dramatic Art in London and became an actress. 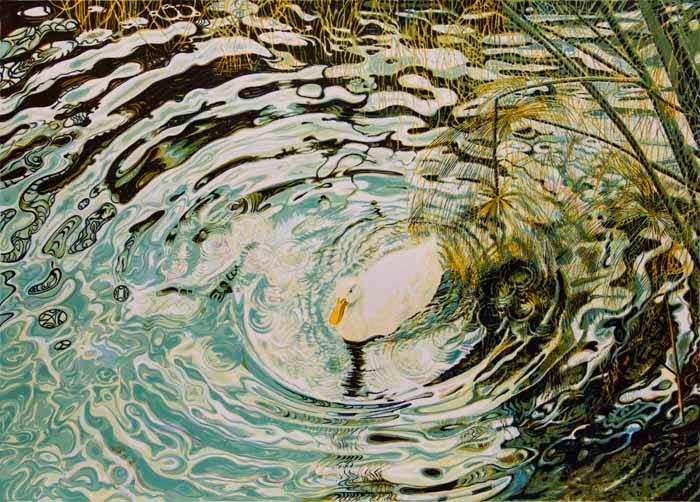 Why did you choose to return to painting, drawing and etching as your artistic métier? Life is often not what you plan! After finishing school, my first wish was to study art, so I enrolled at the Sydney Tech and felt proud walking to class with my art folder. A month later, my sister and I sailed away to Europe. First I worked as a mannequin in Paris, then I studied dramatic art at RADA in London, followed by 10 years of acting in the theatre, films and TV, in London, Paris and Rome. But art never left me, indeed I say that ‘art saved me from going crazy’…because as an actor you’re a ‘King’ one day and an outcast beggar the next. Very unsettling to live with, so during the long waits on film sets or waiting for my agent to ring, I drew and painted and felt happier. When I married my dear Paolo, in Hong Kong, my art flowered and so it was 'goodbye acting career'. 3. What aspect of drawing and etching gives you the most happiness? 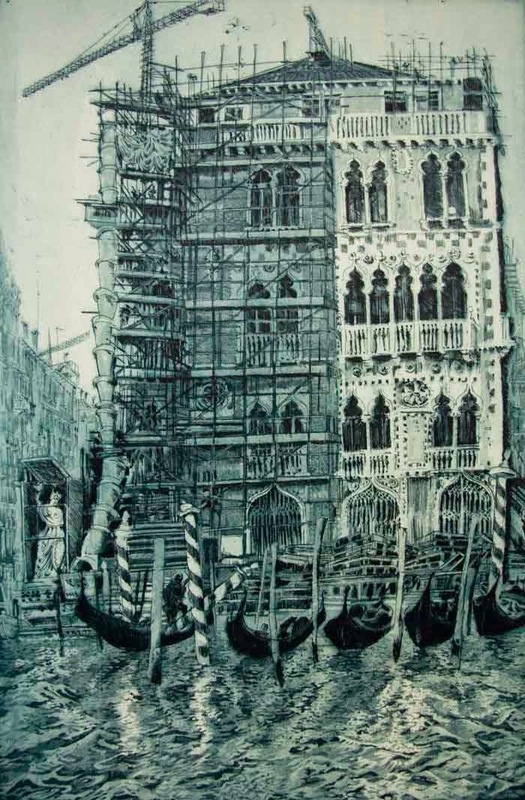 In Hong Kong I was fascinated by bamboo scaffolding, which was followed with a series of drawings and etchings on this subject. I was nominated “the Bamboo Scaffolding Artist” and won first prize at the Hong Kong Biennial. Bamboo scaffolding was a beautiful challenge for me and, as always, I fall in love with a subject that enchants me and then happiness follows. I once wrote on a water-colour sketch of some lychees: 'when I draw I love the world'. 4) What do you find the most challenging part of your work? had the greatest impact on your artistic career? 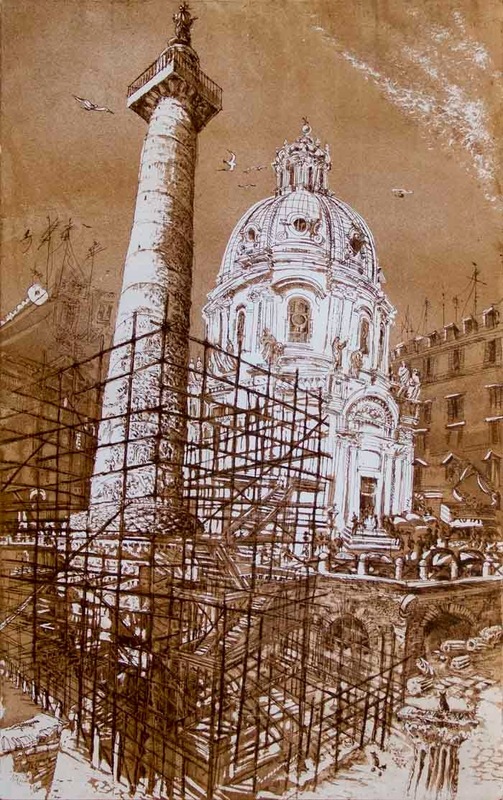 One important fact, which I understand now after many years of depicting Rome, with countless drawings, etchings and oils, is that I feel this must be a ‘gift’ from my father, Ernesto, who died when I was very little. He was a Roman, a diplomat and an artist, so my sister Luciana and I grew up with his pictures in the house. Rome, Italy, remained in my psyche as a place of wonder and emotions. 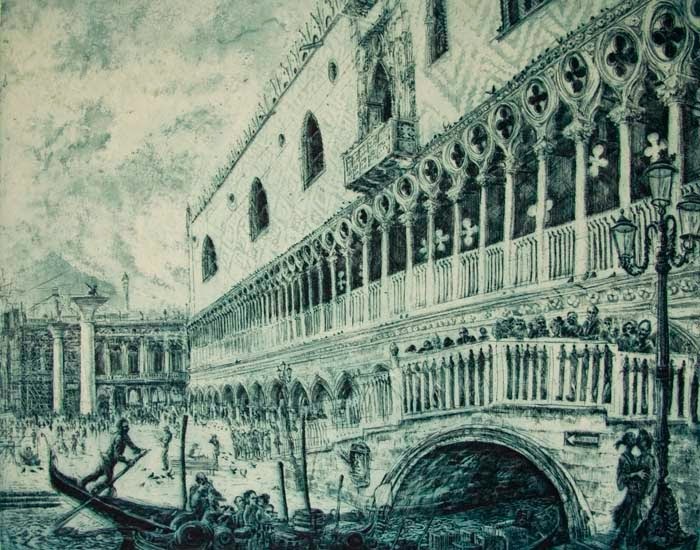 So when my husband and I returned to Italy to live, I began drawing life in Rome, and other parts of Italy, as if I were paying tribute to my father’s city and country. 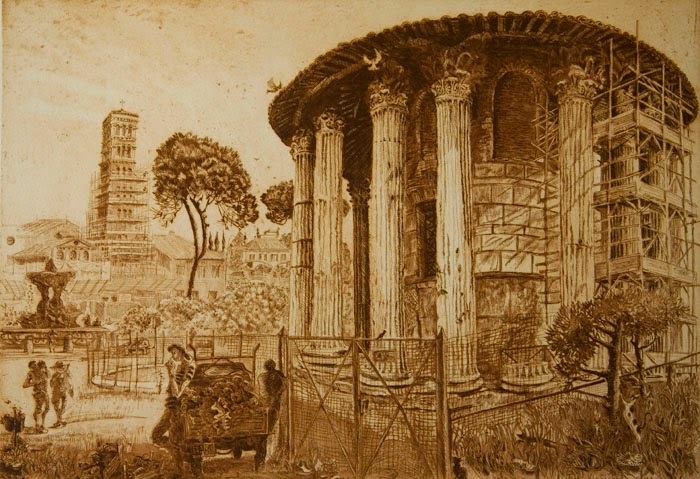 The great Piranesi has also constantly inspired me, so much so that when I started sketching Rome, I held the book of Piranesi’s etchings of Rome close to me to give me courage, but when I drove away to go home, I realized the Piranesi book had fallen off my car and was lost! At that, I understood that HE, the maestro, wanted me to ‘do it’ alone. 6. Describe what your studio is like and whether you have a set schedule of working there everyday? Or is the process more fluid? My studio is a mess! Whenever I gather courage to tidy it up, I become overwhelmed with the desire to paint! I work sporadically, anywhere and anytime, on any piece of paper I find. Sometimes I am so attracted by something that it’s like falling in love. When the ‘Broccolo Romano’ (see below) drew my attention, I sketched it and sketched it, for days buying more and more fresh ones… my poor husband had roman broccoli for every meal! Instinctive, purely instinctive, as if I am told or helped by someone else to draw and paint. Difficult to describe, working as a contemporary artist in Italy. I remember during a collective exhibition where I hung my Roman etchings, I went off to have a coffee and when I returned I saw a man looking intently at my etchings, he turned to me and asked “Where’s the artist?” I answered that I was the artist, and he immediately muttered ‘Oh, a woman!’ ~ lost interest and disappeared! Is it a fact that a female artist has less value than a male artist here? 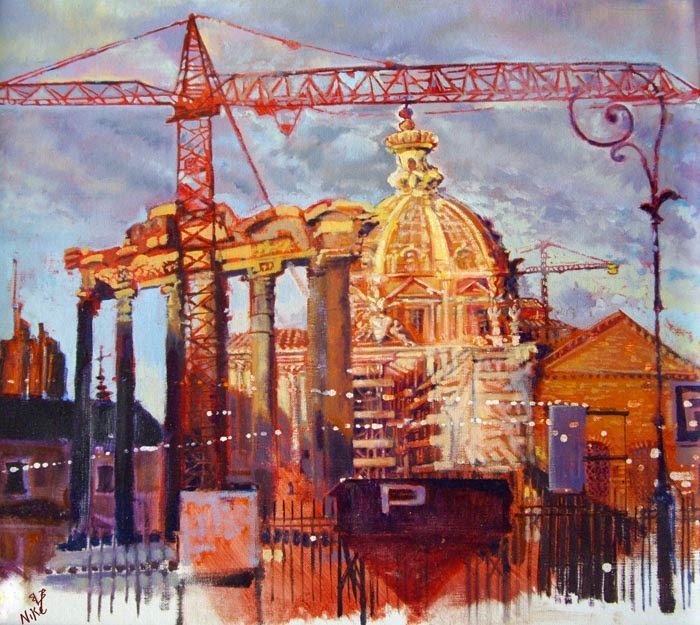 Italy inspires artists, but the business part is less inspiring. Yes, what do painting and drawing give us in this digital age? Painting and drawing – Art - is an expression of our inner soul, our creation, our being. It is an outlet for our creativity. I only need a pen or pencil to do this, I don’t need a machine. However, if you can do it with a computer, or bricks, or words or sounds, or on a machine, then ‘ben venga’, as they say in Italian: Go ahead!